Living the J.O.Y. Principle | My purpose here is to embody the J.O.Y. Principle, Jesus First, Others Second, Yourself Last. My purpose here is to embody the J.O.Y. Principle, Jesus First, Others Second, Yourself Last. APRIL 2019 – I edited this post to show photos from another addition to the library at Heart House as of December of 2017. It was a very warm day 1,300 miles from my home, nestled within the mountains of Southwestern Virginia, (not West Virginia mind you) in December of 2012 that my idea of putting my faith in action got a supercharge. For the first time I was enjoying an opportunity to enjoy a close relationship with God in another country. Yes, God is present wherever you are, but we don’t always allow him in. Our usual day-to-day routines easily crowd him out. When I walked into Heart House and past the mural that described what the purpose was I stopped at a nook that served as the library. Keep in mind that up to 100 kids share this space and the books within. Carol Heath was gracious enough to let me button-hole her and inquire about her wishes for a bigger space for the library. Again God’s voice was so clear. He said you know what you must do. 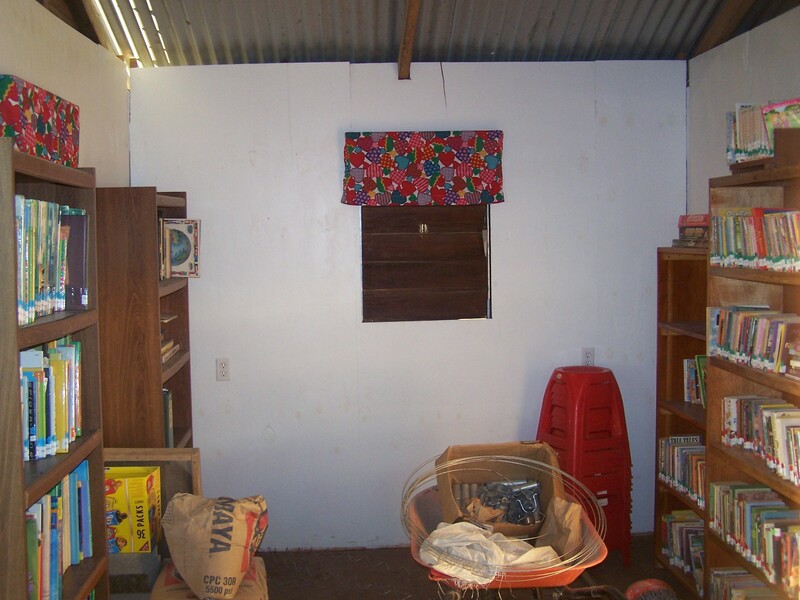 You must lead the effort at home to gather books to fill the new library. I asked Carol to show me the intended space for the library and began to scope out the need. 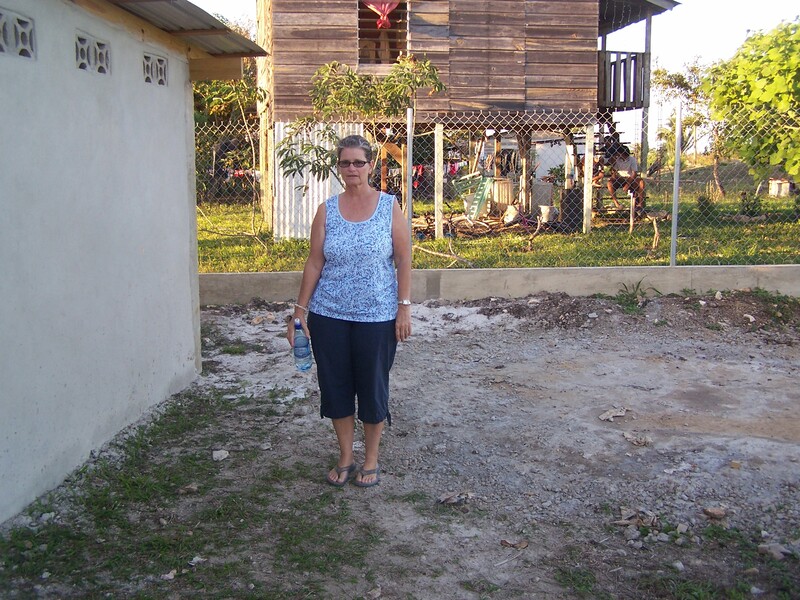 Carol standing in the spot the library would fill by the time we returned in December of 2013. The goal was simple, enough books to give the library a start. So the matter at hand was to set a goal. I had a former pastor say if you never aim for a target you will miss every time. Enter the wildcard in the equation, the way to get children’s books from Virginia to Belize. Thankfully we were already in the process of gathering backpacks to send to the kids from Heart house. This is actually a step up from the shoe boxes like Operation Christmas Child sends around the world. 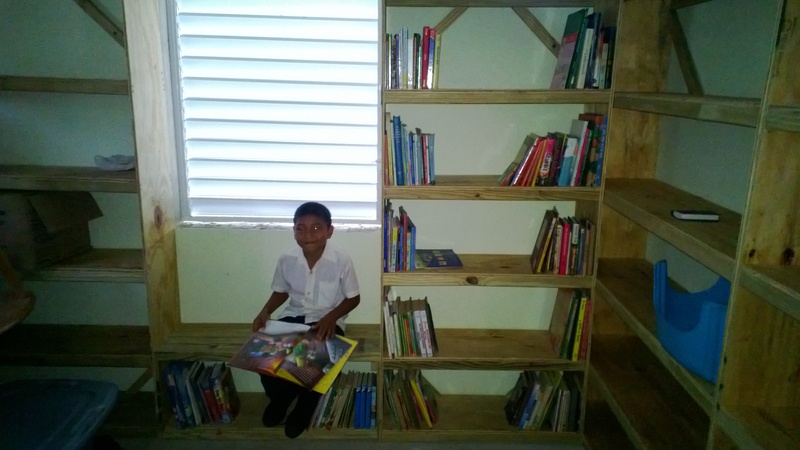 So adding boxes of books was just some more work and thanks to Terry Stinson, a missionary from the USA living in Belize at the time, this was made possible. 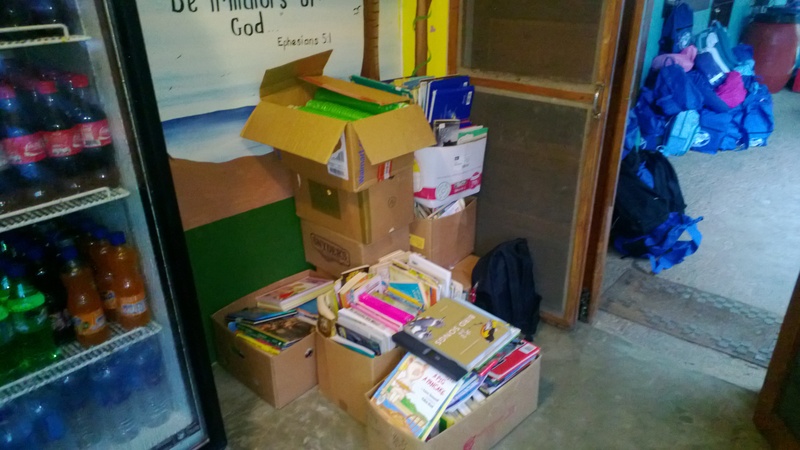 Then 600 odd books destined for Heart House sit at the Baptist Training Center near Belmopan prior to delivery. 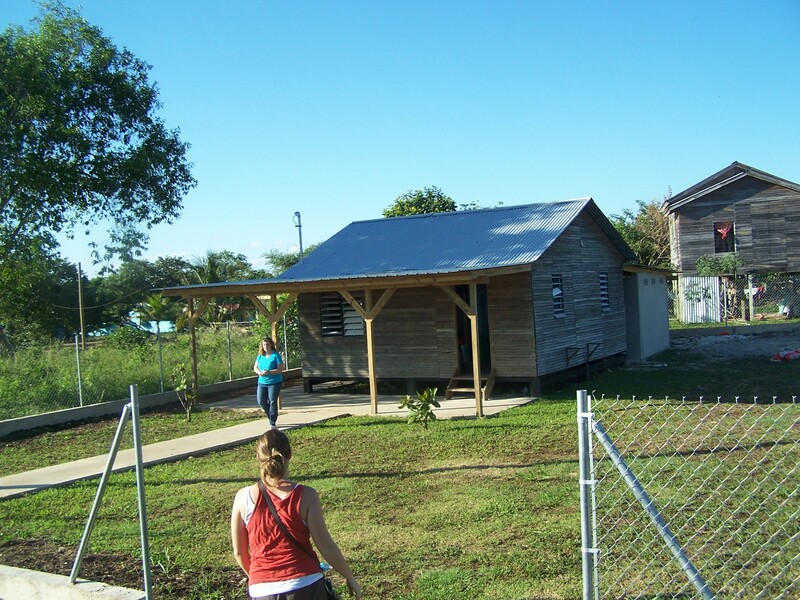 So when we arrived at Heart House for my second trip in December of 2013 the shell of the library was complete. But a library isn’t a library without shelves and books, right? 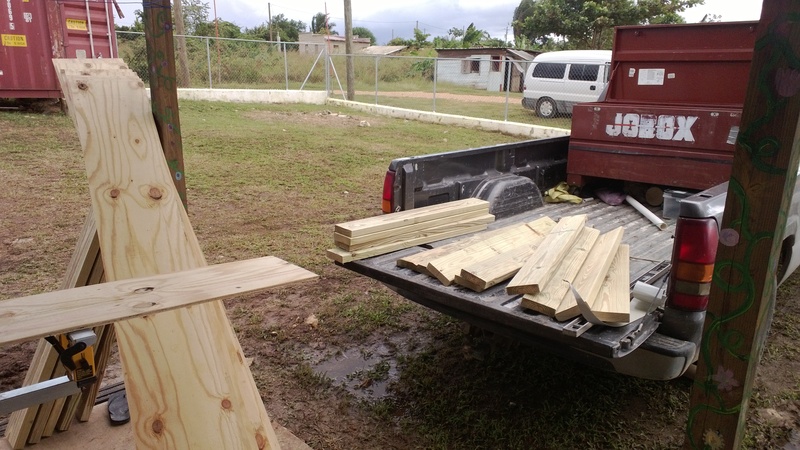 So God blessed our team with the resources to be able to but the lumber necessary to construct the shelves and the know-how of Tim Heath, Terry Stinson, Ron Gilbert and others to get it done. This is where I must insert the funny story about the photo that follows. In order to show what the new library would look like we had to kind of stage a photo. I mean you have to understand organizing, cataloging and readying all these books just required much more time than we could devote. So instead i enlisted the help of a Heart House kid named Ivan and asked him if he wanted to be famous. I had a pocketful of Belize coins that I could not use once I left the country so I told him I would share them with him if he would post for a photo in the library. 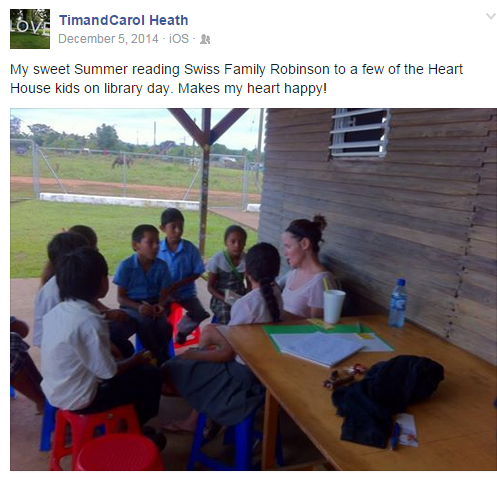 Since December of 2013 Carol and the others have managed to get the books categorized and cataloged so that the children can use them. I recently got this photo of them with books enjoying their library day. Here is another picture I took in December of 2013. The library is directly behind the white wooden doors which are the new bathrooms. The library is behind the two white doors which are bathrooms. The library is not by full by any means. We continue to work on that and welcome anyone who wants to take part. I look forward to returning to Heart House this summer to see the library in person. EDIT: In December of 2017 I got to return to see the Heart House library 4 years into its life and wow, what a difference there was. 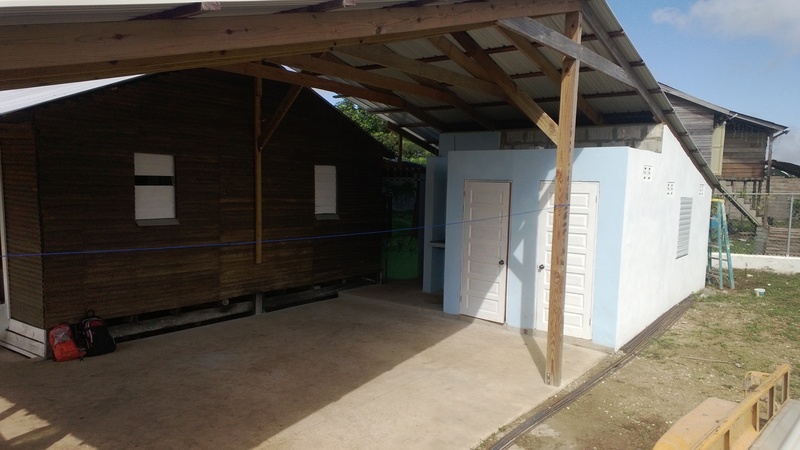 APRIL 2019 – I edited this post to show photos from another addition tot he library at Heart House as of December of 2017. 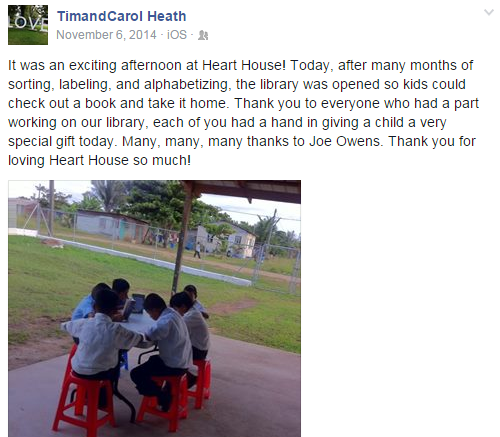 So when we arrived at Heart House for my second trip in December of 2013 the shell of the library was complete. But a library isn’t a library without shelves and books, right? 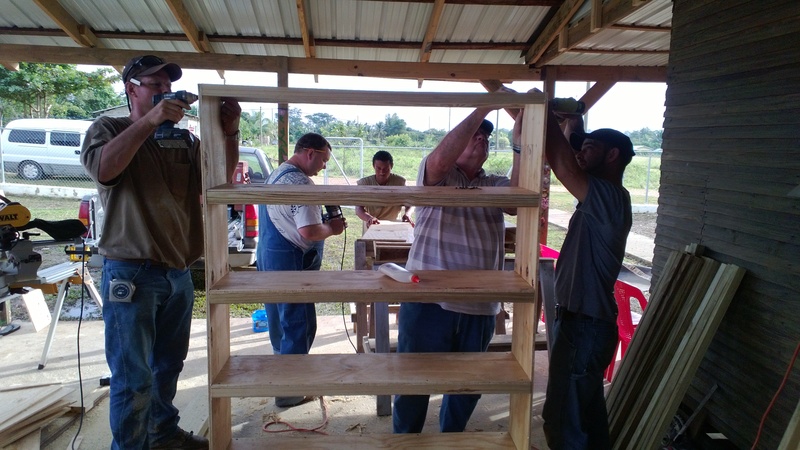 So God blessed our team with the resources to be able to but the lumber necessary to construct the shelve s and the know-how of Tim Heath, Terry Stinson, Ron Gilbert and others to get it done. How Can I Help Hurricane Victims? Make a Flood Bucket! Everyone in the United States and likely many in any area of the world with mass communication has seen the heart-breaking coverage of hurricanes that ravage the Southern and Southeastern regions of the united States. These powerful storms wreck unimaginable havoc on hundreds of miles of shoreline and even far inland with high velocity wind, life-threatening storm surge and the resulting flooding. I along with several others from my church association recently returned from a disaster relief stint in Southeastern North Carolina. 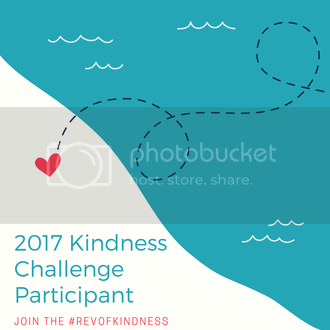 From my personal experience I can share a way you can be a key contributor to the recovery of those affected by these storms. Last October, following the disastrous Hurricane Harvey that inundated Houston and the surrounding areas in Texas with Apocalyptic amounts of rain our church saw an opportunity to come alongside the victims by creating something called a Flood Bucket. This is a five-gallon bucket filled with the items necessary to begin the clean-up and clean out of whatever remains following a water event in a home or business. This is a list of the items that are included in a Flood Bucket. You will notice this is from the Baptist General Assembly of Virginia, the organization my church association partners with to do Disaster Relief. This is not the only list by any means, but simply a general linguine for the purposes of this post. You will also notice that their is two columns to the right with item numbers of these items at Lowes and Home Depot. I know from our experience if you are unable to purchase the items individually or just choose to allow them to assemble this they will. For a couple of reasons, which include the lateness of the season last year our buckets were not used in 2017. 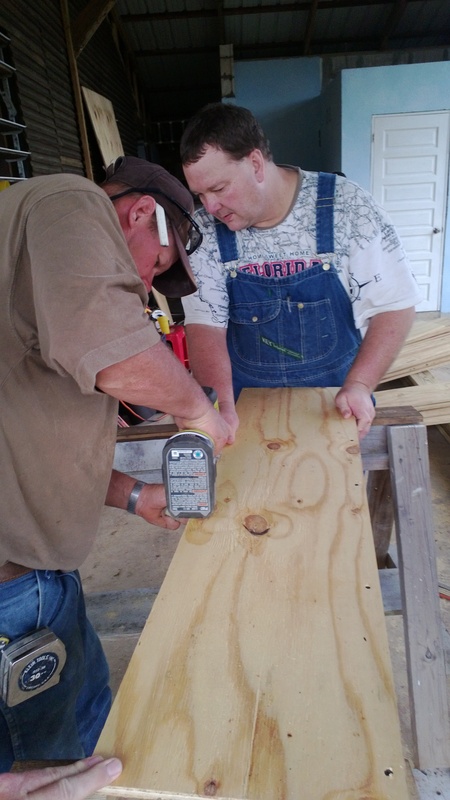 But we did put them to use on our trip to North Carolina following Hurricane Florence as we took part in the beginning of abatement of the flood damage. If you would like to read more about that you can do so here Hurricane Florence Disaster Relief. We found many uses for these buckets as we pulled necessary items out of them we did not have on our Disaster Relief trailer we pulled down with us from Virginia. 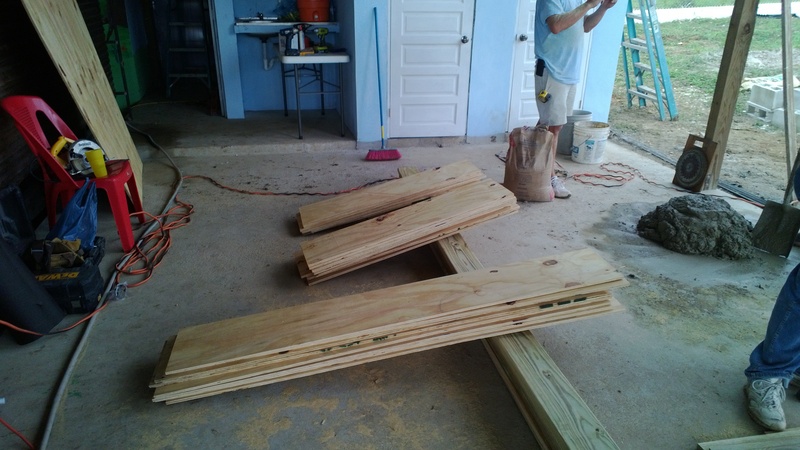 We used them to collect debris, as stools when sitting to pull nails and staples and also cut lids in half to use as temporary dust pans until we could get to the store to purchase real ones. The intent of the buckets is to hand them off to home owners so they can begin to clean up their home if a Disaster Relief team is not available. In such cases as the New Bern area of North Carolina affected by Hurricane Florence and Mexico Beach, Panama City and Panama City Beach which felt the powerful effects of Hurricane Michael this may be exactly the need. This is a great project for churches, civic groups or even families to get behind. 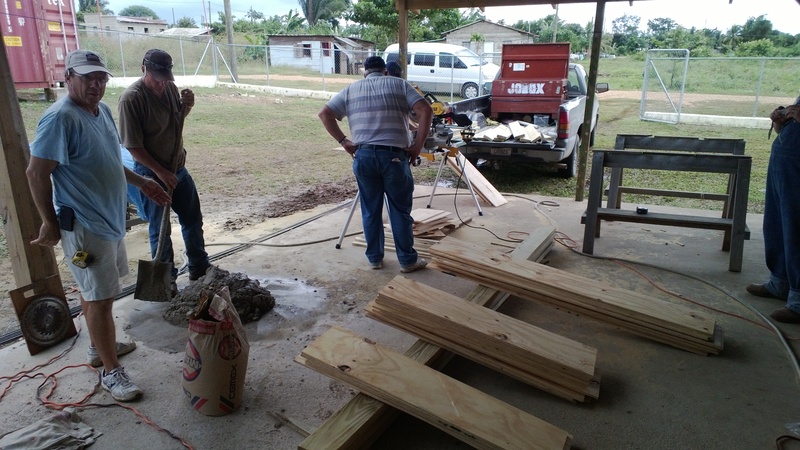 Once completed you can deliver then to a local church or relief group for distribution. We all feel a call to help others in situations like this and this is an incredible way to do just that! Last November I finally got the opportunity to go through the training that qualifies you to be able to respond when a natural disaster takes aim at the U.S.A. The happy news was that five others from my church attended the same training. Fast forward to this week and 4 of the six made the 7 hour trip to Eastern North Carolina for relief operations following Hurricane Florence. Below is a picture of our team on our first job site in Chocowinity, N.C. Our four are the two on the far right, the one in the front middle and yours truly in the third from the left of the back row. We were blessed with a couple of ringers who have shared so much valuable experiential knowledge with our team. For more than half of our 11 person crew this was the first time we have been able to enter the field following the type of disaster that changes lives. We were thankful our first experience was more measured, with a locale which only had around a foot and a half of water in the home. The protocol is much the same no matter the amount of inundation however. Sheet rock or whatever material used for walls must be removed due to the concern of deadly mold forming within. In this particular house located in Chocowinity, N.C. we started by ripping out the water ruined appliances. Next we began to score and remove the walls, sheet rock in this case at 32 inches above the floor. In the next photo you can see why there is the concern with the affects of the water in the home. This was after only a few days and would only continue to grow. As you can see the carpet was already removed and beneath all the sub flooring was severely saturated. That will dry and after the job was completed we sprayed a solution to not only kill the existing mold, but retard the development of new. One of the things I most enjoy about mission work is the great Christian family you are eagerly welcomed to when you go out to share Christ’s love. Of our eleven member team I already have relationships ongoing with 9, but met two new men who immediately became like brothers in the midst of our work. 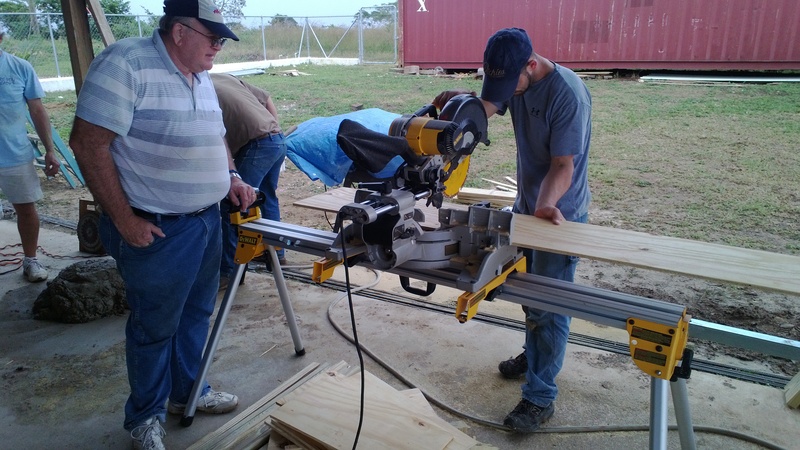 One of the 9 I already knew is now featured in a progress report with the BGAV, or Baptist General Assembly of Virginia, one of the groups in my state that organizes the disaster response. You have to understand, but of course cannot fathom it until you are there, how big a deal it is to house, feed and keep laundry clean for 50-70 volunteers for a week. We’re talking three meals a day for men and women expending thousands of calories as they seek to minister in all ways to those hurting. Recently the “call out” for volunteers was extended until mid-December and that was before the latest storm, a Category 4 hurricane named Michael plowed through the Florida panhandle. Much of the worst destruction in north Carolina was around the New Bern area. 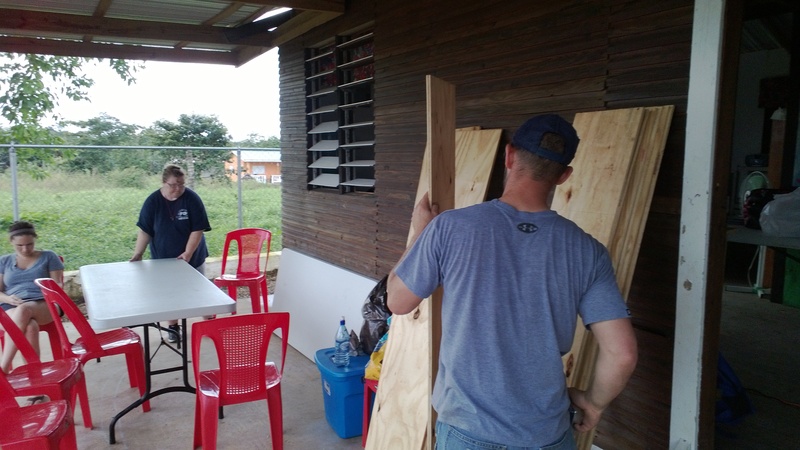 But the destruction was so severe the nearest staging area was almost an hour northwest in Washington, N.C. We were blessed to be hosted by First Baptist and Second Baptist Church of Washington. Both sites had shower and washing machine trailers to help us clean up after long, hard, dirty days. Many people hesitate to take part in this type of ministry because they feel they have no skills to put to use. 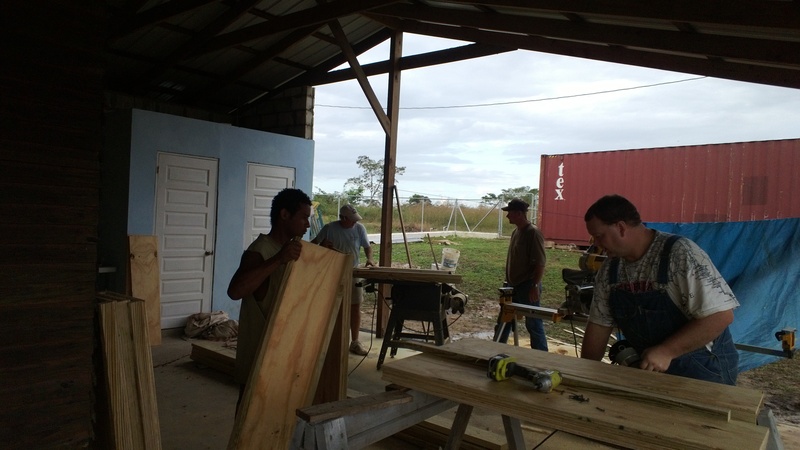 Anyone can help wash, fix food, arrange supplies or even go out and help clean up a home. God equips us for whatever He wants us to do. What we are required to do is to go! What kind of noise would peak a Christian’s interest? The Enemy has a never ending arsenal of words, and what seems like an eternity of our mortal time to sling them at us. But in the end it is just so much NOISE. Why? Because God put His eternal plan in place even before Satan fell from Heaven and took 1/3 of the angels with him. Beyond that you have all the noise from the media trying, as The Enemy’s surrogates, to marginalize Christians at every turn. I find it interesting that there is sensitivity to every other religion, or thought pattern about freedoms but for Christians there is nothing but condemnation. Even the suggestion that belief in God is some sort of mental condition. As Christians we are directed to make our own noise, but in a way that honors the Father and proclaims the God News of his eternal plan to all we meet. Whether or not the intended recipient is inclined to listen or classify our words as noise is there prerogative. Our instructions are clear: GO and TELL. For one day the NOISE will be the result of Jesus’ return to earth and the beginning of his millennial reign. I know the silence will be deafening then. What are you focused on today? For the past six or so work hours I was focused on what we call an EIR or emergency fix of a work issue. Because of the nature of the process it was important to be focused only on that particular item even when I had other important items I could have tapped along down the road at the same time. In our day of multitasking we think we can just do any number of things and do them well and maybe in some cases we can, but not in all. In our Christian walk we have to stay vigilant in our focus or we are open to the possibility of temptation which can derail our witness. We must also keep in mind what the Holy Bible tells us about the way we should deal with temptation. The bible tells us we WILL be tempted. That much is 100% clear. But, it also tells us we can overcome this temptation, if we stay focused. God will provide us with an escape. God will not tempt us past what we are able to withstand, even if we think He is. A long time ago my Christian mentor, who is long since enjoying the fruits of Heaven, taught me about the J.O.Y. Principle: Jesus is first, others are second and you serve Yourself last. I had to develop my focus on this principle over time, but now I feel I have it in place. It is really not so hard, you just have to be willing to sacrifice for the better of others. This is my idea for focused, I plan to bounce around to read others. Promises can be a great thing, especially if made by someone in whom you have a deep amount of trust. Someone perhaps like the Creator of all, who just happens to also be our personal Saviour. He made a promise to each of us long ago that He would return to earth one day. That is referred to as the Glorious Appearing. Why will it be glorious? Because when Jesus returns for the Second Coming it will be to redeem all of those who have chosen Him as their personal Savior. Those still breathing and those whose life ended previously. He will return with a trumpet sounding and riding on a cloud. He will defeat Satan and establish His kingdom on earth for 1,000 years. That kind of promise is one you can internalize and feel good about forever, which is exactly how long you will spend with our Creator in Heaven.